Sm. 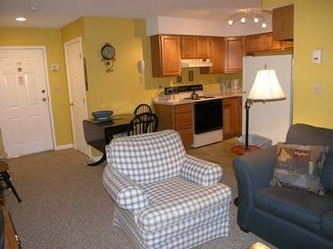 1 Bedroom Condo, #121 - At the Nordic Inn Resort ...Discounted Rates!! 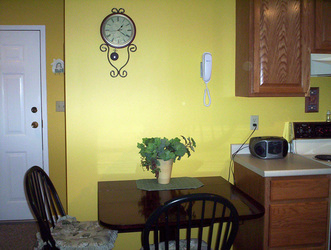 This is our only studio unit at the Nordic Inn. This compact home is a smaller version of our one bedroom/one bathroom unit. It's located on the first floor, in the rear of the building, permitting easy access from both the porch deck and the interior hallway. This unique unit is a perfect size for two people. 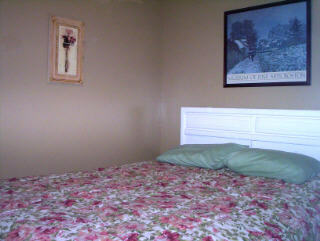 Unlike many studio units, the bedroom is private and separate from the living area. We did not skimp on the kitchen either... its full-size and fully applianced. You'll find this unit an affordable alternative to our larger one bedroom unit.